When I reported my findings on BCML to Erv he was dismayed. He asked Engineering to continue designing the BCML version of the B6900. Shortly after that meeting we all met with Bob Merrell on one of his frequent visits to the Mission Viejo plant. Bob was very concerned; Burroughs needed the B6900 to be a success to compete with the new IBM 370 series mainframes. The decision was made that, at least for a while; a parallel CTL version of the B6900 would also be pursued. So, as a result we had two engineering teams. One was lead by Bob Kim, which worked on the BCML B6900, and the other was under the leadership of Bob Leamy which worked on the CTL version of the B6900. At this time, Burroughs Corporate Engineering had a mandate, and BCML was the dictated logic family for mainframes. 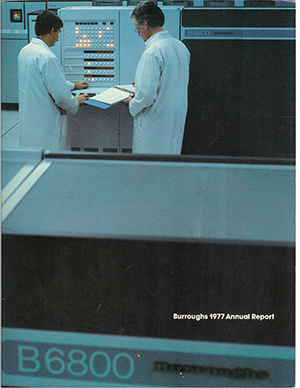 Arnold Spielberg told me that the reason for this decision was that Burroughs management felt the company should be vertically integrated, making as many components of the computer systems as possible, because that is what IBM did. Bob Merrill and Erv Hauck fought the decision to use only BCML, but it was a battle they were not winning. So the plant expended resources, designing a BCML version of the B6900. Problem abounded, because the BCML logic family was so limited. In many ways, the B6900 BCML was a through back to the B6700, almost all hard logic design. Bob Leamy’s group was looking at using a mixture of CTL and TTL, which had dense memory elements. As a result, Bob’s group was moving ahead with more modern design methodology, like using State Machine Architecture. Rancho Bernardo could not deliver half the parts, and the cost was out of control. Erv flew to Detroit, met with Bob Merrill, and although I was not there, I was told that a very fiery meeting took place with Mirabito, Dr. Johnson, Herb Stopper and others. Erv basically laid down the facts; the B6900 could not be done in BCML in its current state. Burroughs would not have a competitive large system. At that point sales and marketing had a fit, and Mirabito finally pulled the plug on BCML, Mission Viejo could do as it saw fit. The CTL version of the B6900 got the green light. Bob Leamy had a small crew, his head designer Gary Beck had the machine design in hand, and now the full resources of Mission were at his disposal. Most of the engineers working on the BCML version were transferred to the CTL version of the B6900, and I had to find something else to do.